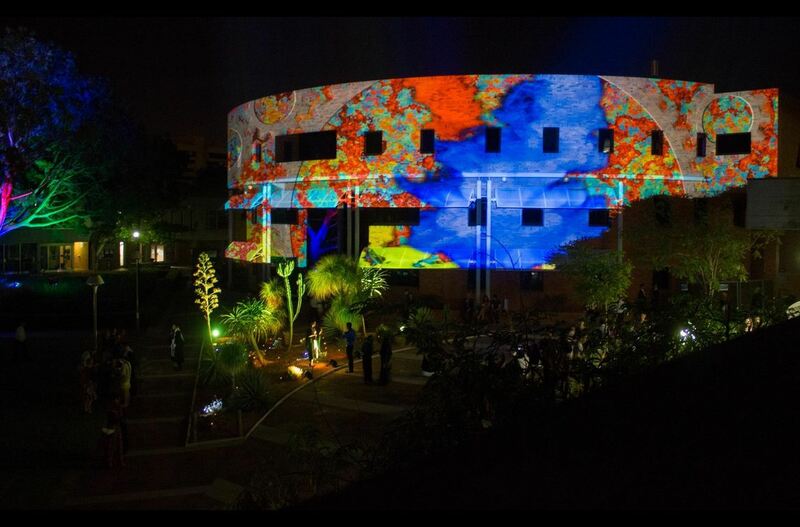 Editors Note: After PPS began working with the community to turn the Perth Cultural Centre into a treasured community asset in 2009, the placemaking bug—and especially the strategy of “bringing the inside out”—spread quickly to another of Perth’s key cultural institutions, Curtin University. (In fact, Australia has been on the cutting edge of the placemaking movement for many years.) Throughout our ongoing work helping universities improve their campuses and public spaces, PPS knows well that it's not enough to build a university around the specialized needs of its academic programs; these institutions also need a collection of distinct gathering places that engage and connect students, faculty, and the greater community. With a “Place Activation” team and an intimate understanding of how quality-of-place leads to innovation, creativity, and comfort—all elements conducive to higher learning—Perth’s Curtin University is a model of thinking outside the box (and the lecture hall) with placemaking. When people think of a university campus, they tend to think of classrooms and lecture halls. The place activation team at Curtin University in Perth, however, thinks of people enjoying the public realm and the many ways it can be activated to give students and staff something to see, do, and experience when they walk out of their classroom or office. 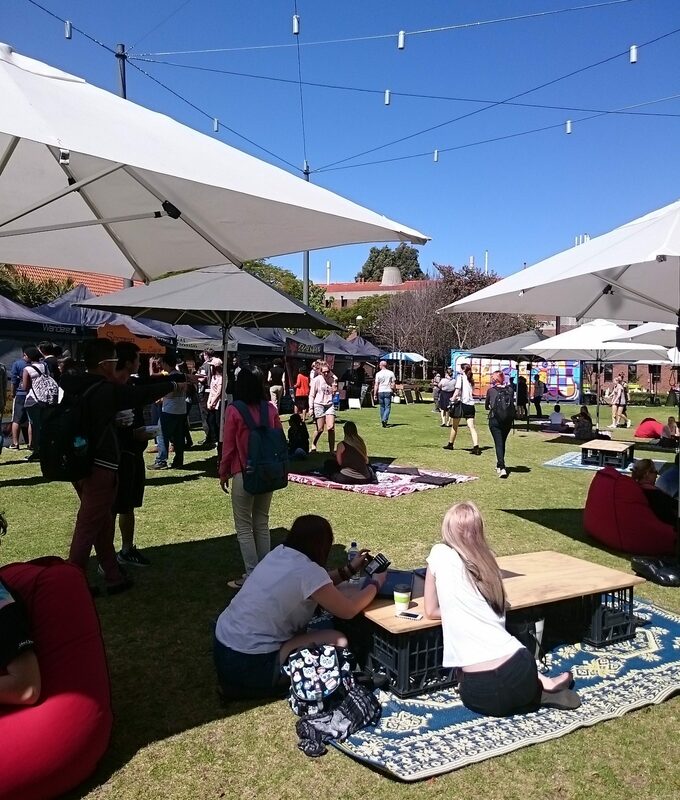 On Curtin’s campus, instead of seeing only a path, some buildings, and an empty patch of grass, you may see a stilt walker on the path, a student painting a live mural on the building, creative workshops, free yoga or a musical trio under the trees and bean bags scattered throughout that patch of grass filled with happy people. Universities are places for research, learning, and discussion, but why should learning be confined to a classroom? With this in mind, Curtin’s place activation team creates safe, comfortable and vibrant outdoor places where people can meet, relax, play, discuss, and importantly … innovate. 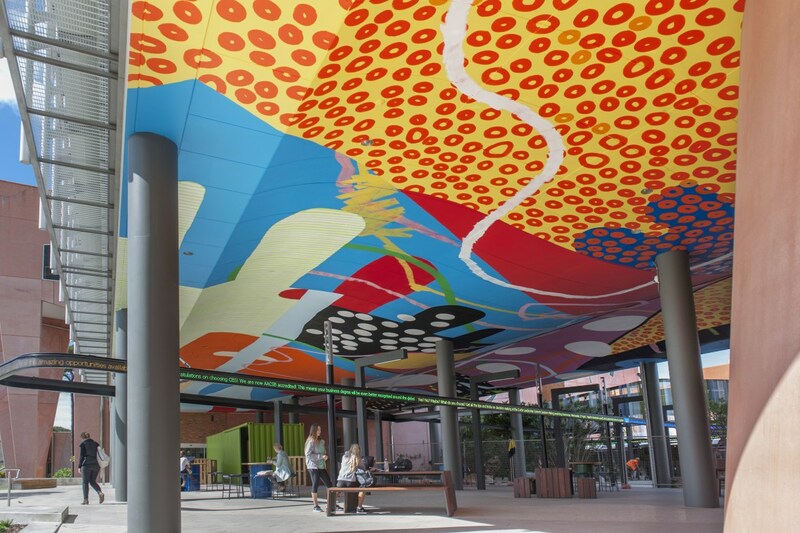 Curtin brings learning outside by incorporating assessed learning activities in the public realm. A pavement chalk project encourages illustration students to practice their skills with chalk on a forecourt painted as a black canvas. Photography students can capture images of Curtin staff and student's life on campus and then have their work installed in large-scale exhibitions on the walls of campus buildings. 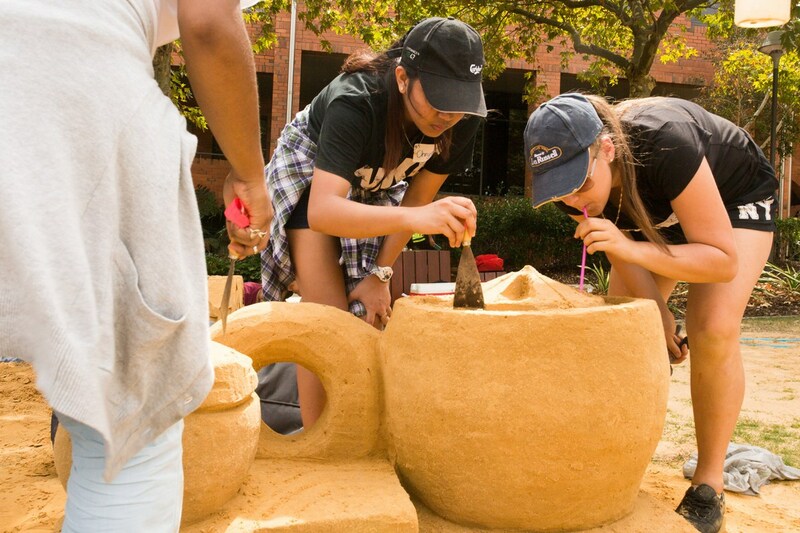 Architecture and design students build 3D abstractions of famous architectural buildings from sand in the central University Forecourt, allowing them to explore the key construction elements and design features while providing an exciting spectacle for passers-by. Place activation initiatives provide key amenities for staff and students, offering numerous places to sit, with funky seating options scattered around campus, such as beanbags and picnic blankets and cushion that are shaded with natural tree canopies and coloured umbrellas. Recreational opportunities complement spaces with ping-pong and foosball tables and giant games like chess, Scrabble and Connect Four. There is also a mix of places for students to just unwind and charge their devices with a series of colored cubic sea container “fun cubes” that feature different activities, such as a free library, video games and even a swing surrounded by tropical paradise scenery! Curtin University was also an earlier innovator of food truck programs, now offering its community the State’s most substantial daily roster of “indie’” vendors providing fresh, multicultural food and beverage offerings from their funked-up vans and adding more character and color to campus life.In application, these activities have encouraged students and staff to spend more of their time and discretionary income on campus, providing economic benefits for the University. The campus community is also spending more active time outdoors, which has proven to have positive health benefits. Since outdoor programming is frequently challenged by weather conditions, adequate shade, hydration stations and umbrellas have been installed to soften the environment. Since these outdoor activation spaces are surrounded by classrooms, sound levels are another obstacle to be taken into consideration. Sourcing activations with appropriately low-moderate noise levels is crucial to ensure that classroom activity and study are not disrupted, so “louder” programming is scheduled during class breaks and free time to allow students a good balance between study and play. Taken together, these examples highlight the many different elements that need to be considered when designing and programming spaces within and around a university campus. These elements can easily apply outside the university environment, as all public spaces need to be activated differently depending on their surroundings, target market and purpose – if you truly want the community to love that place. We love making great places at Curtin University, and it’s especially easy to do when you have such a beautiful canvas to work with. What are some of the most successful place activations in schools and universities near you?